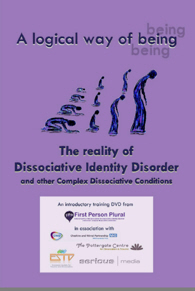 Logical Way of Being – the reality of dissociative identity disorder & other complex dissociative conditions is a new introductory training DVD produced for First Person Plural by Serious Media. A Logical Way of Being is an information and training DVD which provides an introduction to dissociative identity disorder (D.I.D.) and other complex dissociative disorders. It gives the viewer information about their primary features, together with some understanding of their origins in early traumatic attachment and abuse experiences. You will gain insight into what it is like to live with D.I.D. and beintroduced to the support needs of these individuals and the role of psychotherapeutic treatment. D.I.D. and a similarly presenting dissociative disorder not otherwise specified (D.D.N.O.S.) are thought to be more common than the current low rates of diagnosis in the UK would suggest. Even after being correctly diagnosed individuals have difficulty finding or accessing the help, therapy and support they need. This introductory training resource will help health, mental health, social care and related workers in all sectors and at all levels have a better understanding; use their existing skills and knowledge to better supportindividuals who have or may have D.I.D. or D.D.N.O.S; and be encouraged to learn more about the conditions, their assessment and how to provide the treatment and support needed. “A Logical Way of Being” produced for First Person Plural by Serious Media features Kathryn Livingston, Melanie Goodwin and Oriel, three experts-by-experience who live with D.I.D. and Dr Mike Lloyd, Remy Aquarone and Sue Richardson, three mental health professionals from the NHS and private sector who are experienced in assessing and treating this and the similarly presenting D.D.N.O.S. Who is the DVD for ? It is designed primarily for: Staff within the NHS, local authority, voluntary or private sector mental and physical health, social caunity services. This includes anyone working in a nursing, client/patient support, or clinical capacity and anyone involved in service design, management or commissioning. Further and Higher Education teaching staff and their students on courses which lead to qualifications for work in any of the above capacities. Therapists working with such individuals may want to use it as a resource for the psycho-education of their clients. Partners, relatives and friends and anyone else who cares for adults or children who have or may have DID or DDNOS. The DVD is supplied as a region free disc in PAL format.